Global Executive: Passionate about leadership and global supply chain. I focus on innovation at the nexus of business, society, environment. The problems are more complicated than that. Where have all the manufacturing jobs gone? If you ask Republican presidential candidate Donald Trump, the answer is clear: China! But there is another, more plausible explanation. To paraphrase Democratic presidential candidate Hillary Clinton, “It’s the robots, stupid”. The U.S. has lost 5 million factory jobs since 2000. And trade has indeed claimed production jobs – in particular when China joined the World Trade Organization in 2001. Nevertheless, there was no downturn in U.S. manufacturing output. As a matter of fact, U.S. production has been growing over the last decades. From 2006 to 2013, “manufacturing grew by 17.6%, or at roughly 2.2% per year,” according to a report from Ball State University. The study reports as well that trade accounted for 13% of the lost U.S. factory jobs, but 88% of the jobs were taken by robots and other factors at home. If not China, what then explains these jobs losses? It’s simple: factories don’t need as many workers as they used to, because robots increasingly do the work. With increasing automation, the manufacturing industry is becoming more productive. From 1998 to 2012, all sectors experienced a productivity growth of 32% when adjusted for inflation – the production of computer and electronic products rose 829%. The researchers at Ball State University calculated: If 2000-levels of productivity are applied to 2010-levels of production, the U.S. would have required 20.9 million manufacturing workers instead of the 12.1 million actually employed. Many of today’s customers demand fast products, such as fast fashion with quickly changing models. Producing far away is only then still an option when margins are high and able to absorb high transport cost for air transportation. Moving closer to markets means more distributed manufacturing which reduces also the impact of disruptive events, such as the tsunami in Japan and the flooding in Thailand. Focus on manufacturing pays off. One example is Greenville, South Carolina. Greenwille was for decades the state’s heart of the textile industry till its gradual decline when confronted with competition from Mexico and South East Asia. “In 1990, 48,000 people still worked in textile manufacturing in the Greenville area, according to the U.S. Bureau of Labor Statistics. Today fewer than 6,000 do” we can read in MIT Technology Review. The U.S. needs to aim at leading the adoption in robotics. According to the BCG report, manufacturing labor costs in 2025 are expected to be 33% lower in South Korea for example and only 18% to 25% lower in the U.S. Therefore, South Korea is estimated to improve its manufacturing cost competitiveness by 6 percentage points relative to the U.S. by 2025. Focus need as well as skilled workers due to the fundamental shift in competences and because programming and automation talent will replace low-cost labor as key drivers of manufacturing competitiveness. The focus on China is diverting energy from the real challenge. This is not only misleading but puts at risk the future of the U.S. economy. Read my full article on Fortune. In 2015, the United Nations General Assembly unanimously adopted a resolution for tackling illicit trafficking in wildlife. The Sustainable Development Goals specific targets to combat poaching and trafficking of protected species. That’s quite some progress, but more action is urgently needed, because more than 7,000 species, in 120 countries, are at risk. This blog was originally posted on the World Economic Forum Agenda. What does Hanjin’s collapse mean for world shipping? The world has just witnessed “by far the largest container shipping bankruptcy in history”, writes the JOC. But the collapse of the South Korean shipping line Hanjin, the world’s seventh-largest container carrier, should not come as a surprise. The shipping industry is ripe for an overhaul. In the past quarter alone, 11 of the 12 shipping companies to publish results have announced heavy losses. Freight rates have been under pressure for some time, due to a combination of slow global trade and surge in capacity created by new cost-effective mega-ships. South Korea’s maritime ministry expects cargo exports to be affected for another two or three months. Emerging technologies prepare the ground for the autonomous world, including the unmanned supply chain with many benefits but also risks to be mitigated. The main challenge and responsibility for the leaders of today is to capture the benefits while finding meaningful activity for all of us. So reads a 2016 report by the World Bank titled Connecting to Compete 2016: Trade Logistics in the Global Economy. 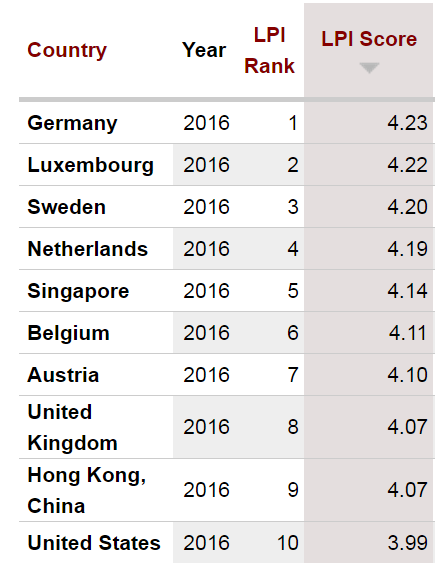 The report features the Logistics Performance Index, which ranks Germany as the world champion in logistics. The country scores even higher than it did the last time it topped the index, two years ago. In the top 30 of the Logistics Performance Index we find 22 OECD countries and 14 members of the European Union. China moved from 28 in 2014 to 27 in 2016. India, currently the world’s fastest-growing large economy, did not make its way into the top 30 this time but has jumped 19 places to rank at number 38. Globalization, logistics and trade have had a significant impact on global wealth levels. In 2013, the Economist wrote that in 20 years nearly 1 billion people had been taken out of extreme poverty. In 2015, the World Bank announced that global poverty was likely to fall below 10% for the first time. Long forgotten seem the walls, fences and barbed wires at all borders. Therefore, the understanding of the benefits of open borders might be fading. Of course, with terrorist attacks and waves of migrants concerns are rising. However, I wish that we are mindful and clear about the effectiveness, consequences and cost of the new global disintegration tendencies. In December 2015, the BBC wrote: “EU border security becomes new mantra“. Not only Europe but larger parts of the world are going through a phase of increasing disintegration: the Brexit referendum, discussions about the exclusion of Greece from the Eurozone and the beginning of the construction of fences along the green borders of barrier-free Schengen. Near Schengen, on 14 June 1985, the picturesque town in Luxembourg, five European countries signed the agreement which led to the creation of Europe’s borderless Schengen area. In light of mass flows of migrants seeking asylum in Europe, Hungary blocked migrants from onward travel to the rest of Europe and constructed a four-metre-tall fence along sections of the border with Serbia – a country not part of the Schengen area. Also, Austria has begun building an anti-migrant barrier across the Brenner Pass at the Italian border. Putting an end to hope on one side and reducing fears on the other. However, it’s not only in Europe that countries are raising the bar. US presidential hopeful Donald Trump wants to build a wall at the Mexican border. Increasing fear of terrorists in the US has led to the reintroduction of a visa for “certain Europeans“. What would be the impact of reestablishing barriers? Citizens would face long-forgotten burdens: the northern Europeans, for example, would experience long traffic jams at the Brenner Pass on the way to the holiday destinations in the south. Labour markets would also be affected: 1.7 million people cross European borders every day to get to work. Consumer prices would rise due to the forced slowdown and necessary adjustments along the supply chain. Waiting and inspection times at the borders would need to be factored into the prices of goods, as well as the changes required to the highly cost-optimized just-in-time concepts – largely applied in global manufacturing in the automotive industry – and the efficient goods supply out of the distribution centres. Many of the products made available by bilateral and multilateral agreements would disappear from supermarket shelves. Disintegration would affect the competitive position too. Europe, for example, might find itself in a very disadvantaged situation given that Asia is continuing to integrate. What if TTP arrives and Schengen leaves? There might also be explosive geopolitical risk involved, with Crimea, Ukraine and new Chinese islands in the South China Sea heating up the debate. As new fences go up across Europe, what tensions could result from countries such as Spain, Italy and Greece being left more or less alone with new waves of migrants? How effective are visas and border controls? Looking back: how safe has the world been with more barriers? Did borders protect Italy from the onslaught in the 1970s of the Red Brigades, Spain from the ETA, Germany from the Red Army, and France from GIA? Did borders protect the US from attack on 9/11? How effective have been the high metal fences and walls, barbed wire, alarms, anti-vehicle ditches, watchtowers, automatic booby traps and minefields along the inner German border from 1945 to 1990? The threat often lies within: “Not one Paris attacker has been identified as a Syrian refugee”, Mashable wrote. The world has experienced decades of advancing global integration. Increasingly open borders and many trade and investment partnerships have strongly contributed to the prosperity and wealth of people and nations. International organizations and agencies have not only supported global growth but also established institutions in charge of dealing with the risks of reducing national barriers. Organizations have developed international ties and many platforms of collaboration to fight crime and terror have emerged. Interpol – the International Criminal Police Organization – has strong links with Europol, the organization coordinating the local police forces across Europe. Within countries, ministries and agencies are increasingly working together. Germany, for example, has established the GTAZ – the Joint Counter-Terrorism Centre – an autonomous authority and co-operation platform used by 40 internal security agencies. The private sector has launched initiatives to protect staff and assets against terrorism and other threats across the globe. Since the attacks of 9/11, security measures have been tightened. Today, individuals and companies are checked against the sanction lists of the US and Europe. Employees appearing on the lists are no longer allowed to be paid a salary, and companies are excluded from doing business. Though, as the Panama papers show, we have not yet closed all the back doors. Social media helps terrorists organize itself and recruit new fighters. On the other hand, the FBI uses internet surveillance software like Carnivore to identify and stop attacks. Organizations such as the Search for International Terrorist Entities are scanning propaganda material and training manuals, and sharing the insights with other organizations. Technology trumps. The internet has the potential to flatten borders while reducing risks. The more people are active on the net, the better economic value can be extracted and (potential) terrorist activities monitored. Which also does not come without concerns and complexities – as the discussion between Apple and the FBI shows. Governments have the obligation to protect citizens and the right to control borders. However, what are the effects of the potential disintegration on citizens, migrants and the economy? The Bertelsmann Foundation warns that reestablishing permanent border controls in Europe could produce losses of up to 1.4 trillion euros over 10 years. We need to understand and be mindful of the impact of our decisions on the economy. All the same, should we apply economic reasoning to a decision on whether or not to offer a helping hand to people in severe need? What does London’s new mayor mean for Brexit? London has elected its first Muslim mayor. It’s a development that many see as reflective of the city’s tolerance and capacity to embrace differences. Will the election of the pro-trade and pro-Europe Sadiq Khan ultimately prove a crucial turning point in the Brexit debate? The city’s citizens have good reason to vote for openness. London is built on trade. Trade has largely contributed to today’s wealth and the rise of many cities, regions and nations. Although trade growth has been moderate since the Global Financial Crises, reestablishing trade barriers might lead to significant negative effects. The United Kingdom has its own currency and enjoys a high degree of economic sovereignty, which would hardly be enhanced by Brexit. Whether the wave of refugees seeking save harbour in the UK would slow down post-Brexit remains a question mark. What’s more certain is that trade barriers regularly increase the price of imported consumer goods, the prices of materials and parts to local production as well as industrial assets, and consequently the prices for goods produced in-country, for internal consumption or for export. What would Brexit entail? Answering this means formulating the possible positions the UK could take after an exit from the European Union (EU). The scenarios include: (1) complete independence, (2) loose association with the EU, and (3) broad harmonization with the EU – the exit could also be structured in a gradual and staged way. Finally, (4) the UK could join another zone, such as the North American Free Trade Agreement (NAFTA). The choice between these options would determine the extent and nature of future trade barriers and the level of impact on society and economy within the UK, in respect to the exchanges of goods with EU members, with countries and blocs the EU has agreements with and finally with other blocs and nations. If the UK stayed largely harmonized or associated with the EU, little change would occur. Under all the other scenarios, procurement, manufacturing and distribution networks would possibly need to be adjusted – immediately or over time, partially or even drastically. How would Brexit impact business? Looking at the cross-border movement of goods, the costs of trade to the economy as well as the impact on cost structures and consumer prices depend on the conditions in four key areas of trade facilitation: (1) border administration, (2) market access, (3) telecom and transport infrastructure, and (4) the business environment. Brexit would affect three of the four areas, namely border administration, market access and business environment. Tightened border administration extends the time goods travel, slowing down deliveries while increasing the cost of transport. In addition, border controls reduce the reliability of the supply chain as the time required for possible inspections is unpredictable. In time-critical industries, this would force companies to hold buffer stocks and re-design logistics systems. State investments in hyper-efficient customs clearance facilities, combining technology with smart procedures, can smooth away some of the negative effects. These approaches include pre-clearance processes based on pre-submitted customs information, or ensuring goods carry digitally and instantly retrievable information which can be used to let them clear customs while passing the border – probably a longer shot. The second area affected by the potential Brexit would be market access. Controls and regulations to structure which companies can sell and operate on the national market is often linked to the protection of local industries. This protection eases the pressure on local companies to innovate and drive serious programs to improve competitiveness. Third, the business environment would be affected too: changes could occur in the area of investment policy and the hiring of foreign workers. The UK government would potentially need to negotiate trade terms and agreements with many partners – a costly process which can take years. In the meantime, the local and foreign companies operating in the UK might be faced with significant uncertainty. In order to compensate for the cost and price increase, the UK government could consider tax cuts and subsidies to ease the pressure on consumers and manufacturers. Otherwise, the rising cost of production could trigger the gradual migration of UK manufacturing towards lower cost locations and increasing dissatisfaction among consumers and citizens. Uncertainty, reduced cost competitiveness and potential measures to protect local industries can lead to the gradual retreat of foreign players. Job losses and increasing dependency on imports would be the consequences. Over time, protected UK industries might fall behind the foreign players due to reduced cost optimization and innovation pressure and hence competitiveness. In the short run, some sectors would be able to reap some short-term benefits. Logistics for example would be under pressure to redesign logistics concepts and build new distribution centers. However, this short-term revenue booster is to be considered economic waste. Instead of making the supply to the local economy and society easier and more fluid, investments would flow into efforts to cope with additional administration, regulation and procedures. Logistics – in common with many sectors – would suffer in the end. For example, as the customers of the logistics and supply chain service providers put pressure back on suppliers, the effect would be shrinking margins. This is particularly challenging at a time when cash and financing needs for newly required investments would be well on the rise. It remains unclear what position the UK would take in the event of a Brexit. What is clear is that the additional layers of work and cost caused by tightened border administration, regulated market access and a deteriorating business environment would result in additional burdens and disadvantages for companies, and especially for consumers and citizens. While initially, some industries would reap benefits, soon the negative repercussions risk spreading across all stakeholder groups – government, business and society. Let’s hope that the election of Sadiq Khan will be followed by more enlightened public sentiment towards globalization, the importance of stress-tested trade blocs and the accomplishment of new agreements like the TPP and TTIP.